From its very origins, the composition of the 15th Battalion (48th Highlanders of Canada) was not comprised of Officers and Men exclusively from the parent Militia Regiment – the 48th Highlanders of Canada. The Battalion was authorized on 6 August 1914 and the majority of its original strength was indeed made up of Officers and Men from The Regiment – totalling approximately 970. However, by the time the battalion was brought up to full wartime strength at Valcartier prior to embarkation, the ranks were filled out by Officers and Men from a number of other Militia Regiments, most notably the 97th Algonquin Rifles from Sudbury and Cobalt and the 31st Gray Regiment from Owen Sound. Once in England, records indicate that although men from other battalions continued to be added to the 15th Battalion’s strength, it was essentially a 48th and Toronto area unit – especially in its Officer and Senior NCO leadership. This would of course all change quickly, as it did for all CEF battalions, once they reached the Front and casualties started to be taken. The 15th Battalion suffered extremely heavy casualties (20 Officers and 651 other ranks) during the 2nd Battle of Ypres in late April 1915 and within days hundreds of reinforcements were brought in from CEF battalions in the UK to bring the 15th back up to effective strength – mainly the 17th and 30th Battalions with latter alone providing 300 men. Much of the 15th Battalion’s Officer and NCO leadership came out of these two reinforcing battalions. By war’s end, men from many other CEF Battalions and units made up the ranks of the 15th Battalion as mounting casualties and the constant need for reinforcements inevitably changed its once Toronto centric composition into a pan Canadian one. 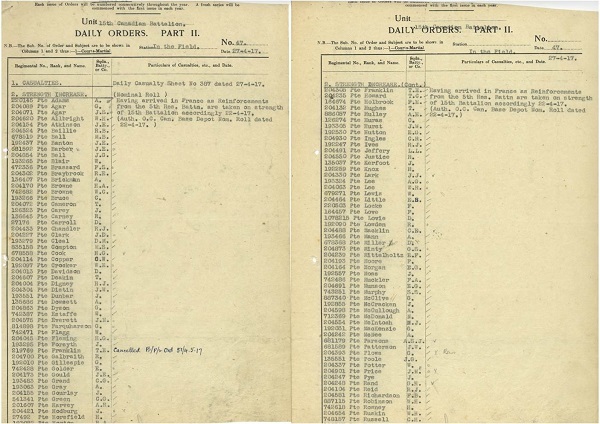 The 15th Battalion maintained Record of Services cards for all men who came onto its strength throughout the war – approximately 6000. These cards are preserved in the archives of the 48th Highlanders Regimental Museum and are available in digital format on this website. The information on these cards clearly show that by the war’s end men from approximately 80 other CEF Battalions and units had served in the 15th Battalion. Although not complete, the following pages contain the cap badges of the majority of those battalions and units.